Walk-Through metal detectors are vital to the success of every security checkpoint installation because they offer uniform scanning of harmful metal while providing improved patron throughput. That's why we've carry the complete line of walk-through metal detectors that offer you improved sensitivity, discrimination and ease of operation. From our basic CS 5000 model to our most advanced DSP-based 33-zoned pinpoint PD 6500i, you're assured the same level of quality and performance that has made Garrett detectors the most sought after name in metal detection around the world. A dual access non-re-settable code to safeguards calibration settings and an audible alarm to reveal any unauthorized access attempts. A built-in overhead electronics compartment to eliminate the inconveniences of a cable-connected console. Multi-phase frequencies and variable tone settings to facilitate multi-unit operation. Modular electronics and unit design for easy on-site assembly and maintenance. The PD 6500i's Access Control Panel is designed for use by authorized personnel with specific, multi-level security codes. It allows authorized users to change settings such as detection Program and Sensitivity. Security of the detector's settings is maintained with a non-reset table sequence code, which indicates every attempt at access to the settings. A tamper alarm sounds within 10 seconds after the Access Touchpad is pressed, unless a proper access code is entered. The PD 6500i maintains all settings even when disconnected from power and does not require recalibration each time the unit is turned OFF and back ON. No battery is required for memory retention. While the unit is in operation, a self-test of all systems is performed continuously with any failures or problems immediately reported on the LCD display. PD6500I Walk Through Metal Detector with exclusive Pinpoint Detection technology. see the light on the side panels. these light up to indicate the location of the metal. a fast accurate clearly visible pin point id walk thru detector. Identifying and locating concealed weapons is easier than ever thanks to the new PD 6500I walk through metal detector. The PD 6500's unique, ultra-enhanced multi-coil detection field pinpoints the exact location of any metal object within 33 distinct areas of the archway, whether on the left, right or in the center of the body, from head to toe. Bright, easy-to-interpret LED pinpoint lights on the archway's exit side, together with green and red patron pacing lights on the archway's entrance side help improve overall traffic throughput.200 levels of sensitivity for each zone provide greater versatility and improve discrimination. Identifying and locating concealed weapons is easier than ever thanks to the new Magna scanner PD 6500 walk through metal detector. The PD 6500's unique, ultra-enhanced multi-coil detection field pinpoints the exact location of any metal object within 33 distinct areas of the archway, whether on the left, right or in the center of the body, from head to toe. Bright, easy-to-interpret LED pinpoint lights on the archway's exit side, together with green and red patron pacing lights on the archway's entrance side help improve overall traffic throughput. The PD 6500i's modular design allows for a quick and simple assembly of its 4 (four) sub-assemblies using only 8 (eight) screws and 3 (three) internal electrical connections. The PD 6500i offers exclusive multiple target pinpointing with 33 distinct zones for full target coverage on the left, center and right side of the body from head to toe. Smooth, efficient traffic flow with easy-to-view, eye-level pacing lights with international "wait" and "proceed" symbols on the entrance side of each panel. LCD Display, alarm lights, LED bar graphs and control touch pads plus all wiring, connections and electronics are integrated into a single lockable overhead compartment which eliminates exposure of wires and external control box. The PD 6500i's exclusive multi-dimensional coil design provides unmatched detection of potentially lethal metal items such as guns, knives and other flat and rod-shaped weapons regardless of location and orientation. Garrett's MT 5500 is easily assembled with only 4 (four) pieces and 8 (eight) screws and simple to follow instructions. The MT 5500 uses multi-dimensional scanning which ensures maximum throughput and uniform screening with a minimum of false alarms. Multiple coil circuitry with dual alarm lights inform operators on which side of the detector the target is located. With "hot spots" eliminated, the unit's detection field is uniform throughout the archway and false alarms are significantly minimized. Audible and Visual Alarms Audible alarm with 3 distinct tones indicating target on the left, right or center of the archway; two LED bar graphs related to the red Alarm Lights that report detectable metal on either side of the unit or centered within it. Unique coil design offers multidimensional detection field with total uniformity both horizontally and vertically. This design, plus a choice of three levels of ankle level boost, eliminates traditional hot spots and weak signals. Target detection is precise regardless of its location in the archway. 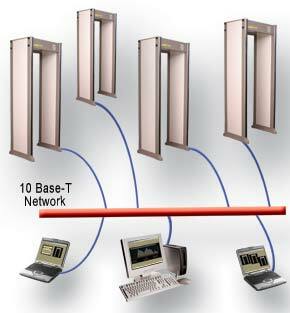 The Access Control Panel is designed for use by authorized personnel with specific security codes. It allows authorized users to change settings such as Program and Sensitivity. Security of the detector's settings is maintained with a non-reset table sequence code, which indicates every attempt at access to the settings. A tamper alarm sounds within 10 seconds after the Access touchpad is pressed unless a proper access code is entered. The MT 5500 includes 20 standard programs, which are maintained in an electrically erasable non-volatile memory, for the ultimate in security application versatility. The unit maintains all settings even when disconnected from power and does not require recalibration when unit is turned OFF and back ON. No battery is required for memory retention. When the unit is in operation, a self-test of all systems is performed continuously with any failures or problems reported on the LCD display. When maximum throughput is top priority, security professionals can depend on the Magna scanner MT 5500 walkthrough metal detector. Coils on both sides of the archway improve traffic flow by helping to locate targets on the left, right or in the center of the body. Dual alarm lights enhance detection by indicating the side on which a target is located. A head-to-toe uniform detection field removes "hot spots" thereby reducing the likelihood of false alarms. Microprocessor-based circuitry enables the operator to calibrate the detector to meet the needs of various security applications. The Access Control panel will be used only by supervisory management personnel. It permits changing the Program and Sensitivity codes and also is used to control such functions as synchronization of multiple units, pulse frequency and tone. The unit further secures control settings by maintaining a non re-settable sequence code that indicates any attempt at seeking access to the settings. A tamper alarm sounds within 10 seconds after the Access touchpad is pressed unless the proper access code is entered. The Garrett Magna scanner CS 5000 is a high-quality microprocessor-based walk-through metal detector that provides superior metal discrimination and detection. It features a DSP (Digital Signal Processor) that automatically suppresses or eliminates electrical interference associated with x-ray devices, video monitors and communications equipment, helping to reduce the likelihood of nuisance alarms and ultimately improving traffic throughput. The Magna scanner CS 5000 offers a diverse range of programs to meet your security needs. The detector is highly portable and can be operated by remote console or a battery pack as needed. LCD Display, alarm lights, LED bar graphs and control touchpad's plus all wiring, connections and electronics are integrated into a single lockable overhead compartment which eliminates exposure of wires and external control box. State of the art microprocessors ensure maximum sensitivity and flexible programming. A heavyweight metal detector designed to withstand the demands of rugged environments like prisons. Built with sturdy 3/32" aluminum armor sheets and assembled with tamper-proof screws to resist the effects of abuse and weather. Microprocessor-based detection and operating circuitry provides reliable, uniform metal detection from head-to-toe. A variety of restricted weapons can be detected, including the Glock 17 and any type of ferrous or nonferrous, small-caliber weapon. Three ankle-boost sensitivity levels ensure optimal screening in any security application. The keypad control box can be mounted on the interior or exterior of the unit. The Magna scanner MS 3500 is a no nonsense detector that provides maximum security with a minimal amount of maintenance. Eight (8) touchpad controls perform all control functions on the MS 3500 and clearly report operation information with alphanumeric displays. Touchpad's include: STANDBY. OPERATE, NUMERIC 2, VOLUME, + / -, PROGRAM and ACCESS. The Movable Display Keypad can be positioned inside the locked and weatherproof Overhead Control Unit or attached to the exterior of the unit. When the STANDBY touchpad is pressed, the unit goes into a low Power Mode, and can be returned to full operation by pressing the OPERATE touchpad. Pressing the OPERATE touchpad initiates a comprehensive, automatic self-test and diagnostic program for instant fault detection. Faults are indicated on the LCD Display. The one-piece assembly houses all the detection electronics, protecting them from weather and tampering. It is weatherproof and has a hinged door that locks with a key. Located on the front of the Overhead, the LED indicator is protected by a clear Plexiglas window, allowing high visibility of the READY LIGHT, ALARM LIGHT and BAR GRAPH LED. State of the art microprocessors ensure maximum sensitivity and flexibility to program the MS 3500 to fulfill various security applications. An audible alarm and red LED bar graph indicates the detection of metal. The LED bar graph indicates the amplitude of the alarm signal. Unique coil design offers multidimensional detection field and three levels of ankle boost sensitivity to ensure uniformity of screening in all security applications. Rugged, heavy-duty 3/32" armor aluminum plates with resilient corner caps for protection against maximum physical abuse. Construction design provides unit with maximum installation stability as well as weather-proof operation. A long-time favorite of security and law enforcement professionals around the world. The Super Scanner virtually eliminates the need for pat downs during weapons screenings, saving patrons from embarrassment and helping to protect security/law enforcement officers from needles and other harmful paraphernalia. Features a sensitivity reduction switch to help minimize rebar interference while scanning at ankle level. Large scan surface enables quick and thorough scanning. Optional holder available to mount the Super Scanner on a belt or car. The Enforcer G-2 is small enough to carry in your hand or pocket, yet powerful and sensitive enough to detect the smallest concealed weapon. Built to operate in rugged conditions. Optional belt holster. 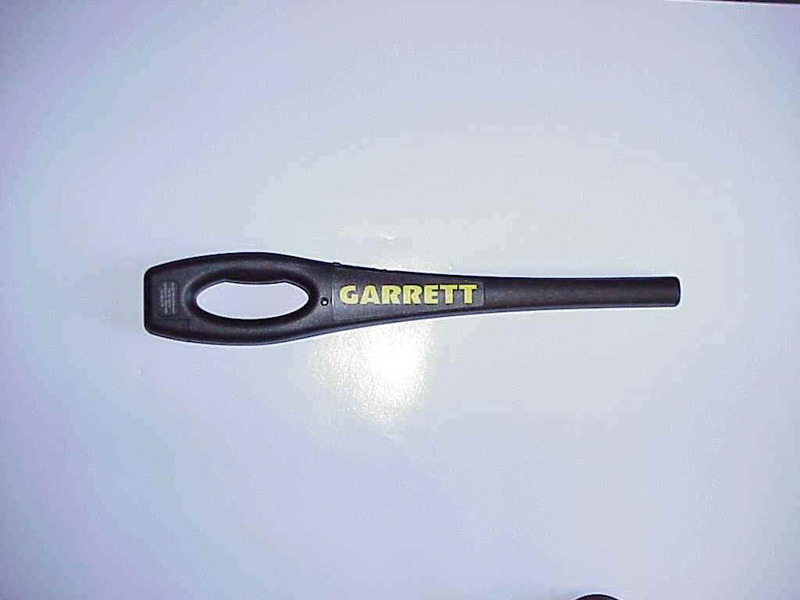 Garrett Metal Detectors recently introduced the Control, Monitor, Analyze Interface Module (CMA), which is a multi-functional product designed specifically for Garrett walk-through metal detectors. The CMA provides remote network access to data collection, alarm statistics and real-time detector events for monitoring and / or analyzing. When connected to a 10-Base T network the walk-through unit can be remotely monitored and controlled from any location around the world. The CMA enables an end user to remotely change any setting on the walk-through metal detector as if physically standing in front of the unit. The CMA also allows end-users to successfully integrate Garrett walk-through metal detectors into an existing access control security system that includes video surveillance and card-access portals. Supervisory access codes are required to change walk-through settings. The CMA enables the end-user to monitor an unlimited number of walk-through units (depending on network structure) in real-time. 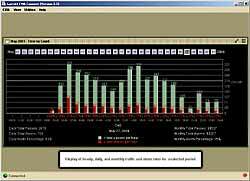 End-users can monitor such information as patron throughput, alarm count and bar graph activity. The CMA also permits a certified technician to troubleshoot the unit from a remote location if needed. Multiple walk-through units can be monitored simultaneously using one CMA per unit. The CMA presents statistical graphs and data that help determine patron and alarm count to better regulate staffing needs at security checkpoints. Data can be analyzed on daily, weekly, monthly or annually basis. The CMA is engineered with a non-volatile memory component that retains all data collected for up to 12 months.